When it’s time to relax and wind-down from a busy day, one of my favorite things to do is catch up on my favorite TV shows! Whether it’s a Netflix original or a cable TV show, I always have to be caught up on what is happening! IMDb created a list of the most popular TV shows based on users and critics. 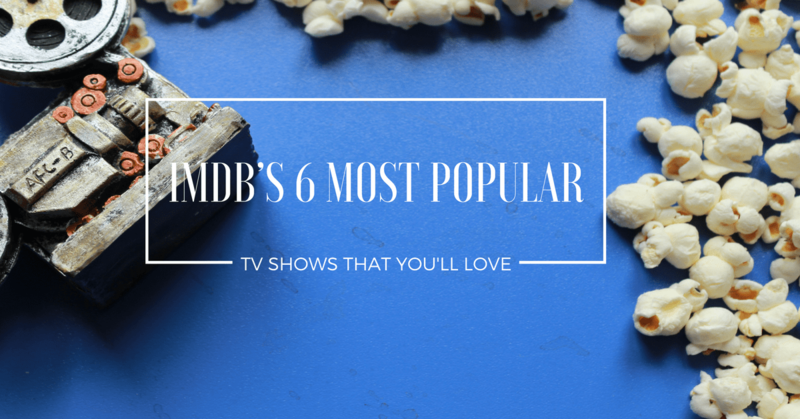 These are the first six, most popular shows and definitely a few personal favorites. Feel free to share your thoughts and personal favorites as well in the comments. Taking IMDb’s #1 spot in the Most Popular TV Shows is AMC’s series, The Walking Dead. This 8 season series shows what life could possibly look like for American’s if a zombie apocalypse were to actually occur, through the lives of a former sheriff of a small town and his allies along with their many enemies. Check out brand new season 8 episodes on AMC, Sundays at 9PM or you can definitely binge watch the first 7 seasons on Netflix! In the #2 spot is Netflix’s new Sci-Fi drama series, Altered Carbon. This series is set in a new world where human awareness is kept and maintained digitally, death is no longer a permanent concept, and humans can almost be anyone they want to be. A prisoner from the past is given an unimaginable task of solving an intricate murder to secure and grant them their freedom. Season 1 is available on Netflix now! At the #3 spot, and a personal favorite, is none other than HBO’s Game of Thrones. Watch as nine imperial families duel for the throne and control of the territory of Westeros as an archaic clan that was believed to be extinct, comes back to create chaos among the people. The current, 7 season series based on George R.R. Martin’s novel series, A Song of Ice and Fire is said to be finishing up with a final 8th season in 2019. Stay tuned for a debut for The Final Season! The first 7 seasons are available on HBO Now as well as Amazon. IMDb’s #4 Most Popular TV Show, Greys Anatomy, which is another personal favorite, is a drama based on all aspects of the lives of 5 surgical interns and their colleague’s that has captivated fans so much so that they have been able to give us 14 seasons! You can watch the first 13 seasons of Greys Anatomy on Netflix or catch brand new episodes of season 14, Thursday nights at 8PM on ABC! Jumping up to the #5 spot is CW’s The Flash. The Flash is CW’s version of the DC Comics character Barry Allen, who wakes up from a coma to find his life is turned upside down and he is now the Flash. He then begins to fight crime in Central City, keeping his word to use his powers only for good. The first 3 seasons of The Flash are available on Netflix as well as brand new episodes on the CW, Tuesday nights at 8PM! This Is Us, on NBC, takes the #6 spot on IMDb’s list as it shows the many ups and downs families can face over the years. Triplets Kevin, Kate and Randall discover each day, a new meaning to their lives through the many trials and tribulations they face themselves and with their families along the way. Season 2 is now airing on NBC, Tuesday nights at 9PM! Check out many of these great shows along with hundreds of others in one of our great DISH TV Packages.